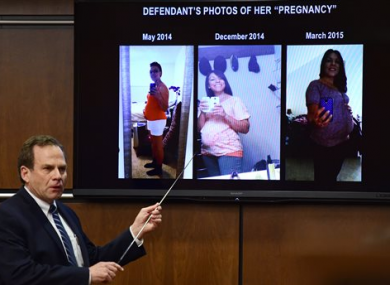 District Attorney Stan Garnett shows pictures of the defendant, Dynel Lane, accused of cutting a stranger's unborn baby from her womb. A WOMAN WHOSE baby was cut from her womb by someone she just met testified this week that she told herself she had to survive for the sake of her unborn daughter and tried to fight back. But Michelle Wilkins said Dynel Lane continued to choke and beat her in the 18 March 2015, attack, and she eventually lost consciousness. When she came to, she said, she was bleeding profusely from her abdomen and made a desperate call to 911. Wilkins’ child didn’t survive — something Wilkins learned the next day in the hospital. Lane was charged with attempted first-degree murder, assault and unlawful termination of a pregnancy. The case revived debate over the legal rights of foetuses and brought calls for a murder charge, which prosecutors said they couldn’t file because a coroner found no evidence the fetus lived outside the womb. Testimony in the trial began on Wednesday and is expected to continue into next week. Lane replied, “If you love me, you’ll let me do this,” and stabbed her in the neck with a piece of broken glass, Wilkins testified. Wilkins, now 27, spoke in a trembling voice but remained calm and composed. She appeared to be near tears twice — when District Attorney Stan Garnett showed her photos of herself when she was pregnant and when she described learning her baby hadn’t survived. Email “'I was asking her why she was doing it' - Woman whose unborn baby was taken from her womb after answering internet ad”. Feedback on “'I was asking her why she was doing it' - Woman whose unborn baby was taken from her womb after answering internet ad”.